Top 5 Social Media Automation Tools You Must Know! There’s no doubt that social media platforms are extremely useful and efficient tools in many ways. Whether it’s raising awareness on social issues or marketing a product, social media can take it to the next level of popularity and effectiveness. However, there is also no doubt that if a company, business, organization or institution wishes to make their brand known on social media, they need to keep at it almost constantly. Regular updates are a must, and sometimes promotions or contests are needed to switch things up. Internet users don’t have very long attention spans as a rule, so just about everything has to be short, to the point, unique, and eye-catching, along with being constant. To accomplish all this in a decent manner requires a certain amount of time and mental effort. And while the time has not yet come that we can reply completely on robots to update everything for us in the way we want it, social media automation has become a thing. The human touch still has to be there, since potential customers don’t like talking or interacting with robots, and are less likely to buy from or through them. Therefore, one would still have to spend some time and effort on various social media platforms. The influencers search on BuzzSumo is unmatchable. It helps you search for influencers by topic, location, and area. You would no longer be wasting time using your social media skills on a sector that doesn’t have enough influencers to make your brand campaign a hit. Influencers have different levels of authority, influence, engagement, reach, and different kinds of audiences. All these are considerable factors in using social media. BuzzSumo is extremely useful in analyzing such considerations and filtering them out according to your needs. Not only this but BuzzSumo also makes lists of the main influencers in your field and communicates with them. This could be either automatically following them and/or adding them to your Twitter lists. The sheer amount of statistics available through BuzzSumo gives you amazing quality content. This would then let you know which of your actions are actually making an impact with the potential consumer base or not. Using BuzzSumo, you can share your information, posts, and advertising with the followers of the influencers themselves, thus hugely cutting down on your time. Not only this, but once you know our key influencers, you can concentrate on building relationships with them, which can hugely pay off within social media and outside. So if you are running an academic consultancy, you can leverage the phenomenal following of true assignment writers and attract the students. Social media scheduling can be a serious hassle for social media marketers and management teams. SocialPilot provides a way for your team to stay connected and up to date by sharing the social media calendar of your venture. This social media automation tool can post up to and over 500 posts to around 200 social media platforms. This kind of bulk posting and updating is essential if one is to reach the users of all platforms. Users can simply upload a CSV or text file, schedule its posting time and date, then sit back and relax. For example, holidays posts can be put together and fed into SocialPilot, after which the social media team can take the day off and get on with their plans. This tool would automatically post when the time is right. What’s more, if a social media manager is stuck for a topic to write about, SocialPilot can also help in that area. It can give you lists of topics relevant to your field so that you can focus your mental energies on actually writing the post or article. As an added benefit, SocialPilot also keeps separate accounts and social calendars for your clients, so that you don’t forget a single event that you’re supposed to cover. Hootsuite can help with a multitude of social media actions. Serious users of social media would definitely need this tool at some point, so it’s just as well to get familiar with it the when one starts using social media for business matters. First off, Hootsuite keeps track of multiple social media platforms all at once. This can make your work a lot easier for you since it tells you whenever your brand is mentioned in a post, status, tweet, review, image, or any other medium. Plus, using Hootsuite means that your brand is everywhere, and so can reach a significantly larger amount of users than you could without it. Once you know how and when your brand is being talked about, you know what the reaction of your potential customers is. Is your product, brand, or speech working or not? Is there some social gaffe in it that needs to be sorted out quickly? Are people extremely excited about it, so that you can give them more? Knowing what is working and what is not is one of the key factors in marketing and promotion, especially through social media, where any kind of news and fame can spread like wildfire and be doused just as quickly. Like BuzzSumo, Hootsuite can also release scheduled to several social media sites. What’s more, it can actually calculate and tell you the best time to be posting, which is another important consideration when updating on social media. Hootsuite Advanced Search: Among other filters, the Hootsuite Advanced search can also search by sentiment, thus finding out what people’s perceptions are regarding a company, brand, or institution, so that you can act accordingly. If a company you have business with is being badmouthed due to its large carbon footprint, for example, it might be wise not to deal with them, and especially not to advertise your connection on social media. In addition to the usual facilities of scheduling posts and analyzing the information on social media, Buffer also frees you from the need to add a time for a post or update. It automatically analyzes the most effective times itself and posts accordingly. An added advantage of using Buffer for your social media needs is that is the Campaign Tracking option. This allows you to keep track of important campaign links and makes sure that all links provided are unique to every post or update. This allows social media marketers to see and analyze the data themselves, as well as letting Buffer do it for them. The main aim for a budding company or organization on social media is to garner as many followers as possible. Even the act of following and building relationships with influencers is mainly because one wants their own following to be as large and influential as possible. Sprout Social can help a lot in this area. What’s more, this tool can also give you an insight into analyzing and responding to your followers. This increases the level and quality of engagement you have with a potential customer audience. The more you interact, the more you can come down on negativity and promote positivity linked with your brand name. 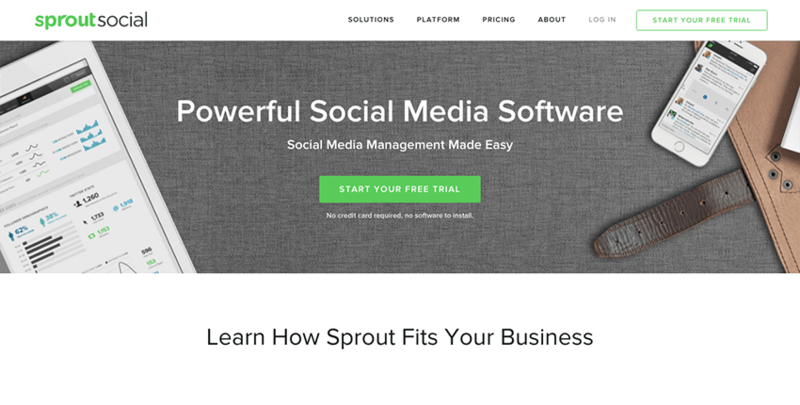 Sprout Social is especially useful for those involved in article or blog publishing. Scheduled posts, tracking of hashtags, mentions, keywords, and SEO factors are of immense help to a writer or blogger. This can help users to manage several blog updates and articles at once. It can also help in viewing how much your competitors are gaining in terms of SEO content and other forms of popularity. Once you know what you’re up against, it’s much easier to fight it and come out on top. Social media automation tools can be a lifesaver for social media managers, whether they work for themselves or are employed by a brand. Making a brand popular on social media can be backbreaking work that can also become monotonous or tedious when done every single day. The tools listed above, and many others like them, are of immense help in doing the grunt work for you. This makes social media representative free to work on what only they can do: provide the human element. Customers would be sure to appreciate when a real person is interacting and engaging with them. Additionally, social media tools actually help a marketer, blogger, or writer do his job better by providing them with precious data and analyses. Social media automation tools can only get better as technology advances. We can all look forward to a time when social media marketing, promotion, and branding could be made even better and more interesting through the use of such facilities.